Wanting to let the sun heat up the farm and beehives, I planned to perform the desperately needed landscaping maintenance on the garden aisles. However the weedwacker would not continue running instead shutting off a after about 40 seconds of idling, or whenever I opened the throttle at all. The blisters on three fingers and the intense DOMS in my shoulder blade attest to how many times I got it started. Was it bad gas mixture that sat all winter? Was it the carburetor that a knowledgeable mechanic found to be on its last leg a few months ago? Either way, my desire to be independent from petroleum powered machinery was reiterated and the most time-consuming task on my to-do list was not attainable. So I spent the time wandering and weeding the garden beds. 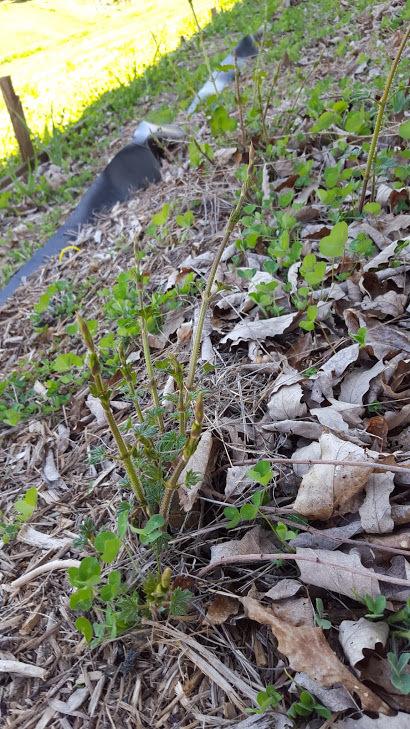 The hops and asparagus were already sending shoots out of the ground while the buds of grapes and blueberries were beginning to swell. 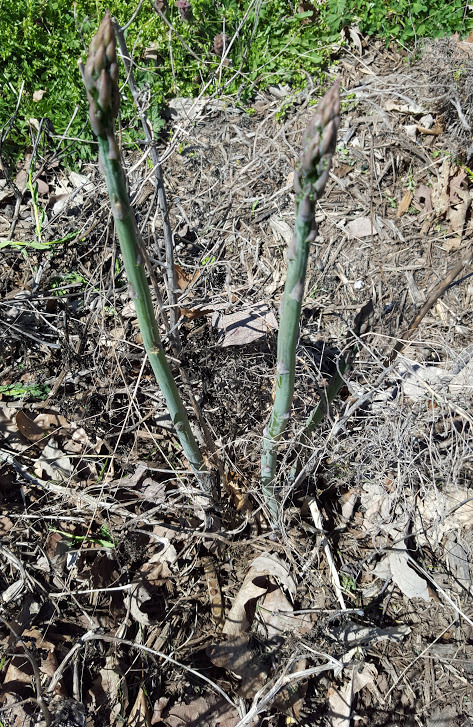 Notice the similarities between young hops and asparagus shoots? They can be harvested and prepared in the exact same manner. I will elaborate on this more in the future. Two plants in my garden are getting hammered by something. I can venture a guess that deer are responsible for eating every single clover leaf as it is nearing maturity leaving untouched stems as well as the few flowers that have had a chance to develop. Of the potential wildlife culprits, turkey are ruled out as we have only ever seen 1 on the farm in 20 years of owning the land. I do not know enough about fox behavior to rule them out. Rabbits are a prime suspect but I feel the distance from the farm to the nearest brushy area is too far for rabbits to feel safe in traversing that distance. 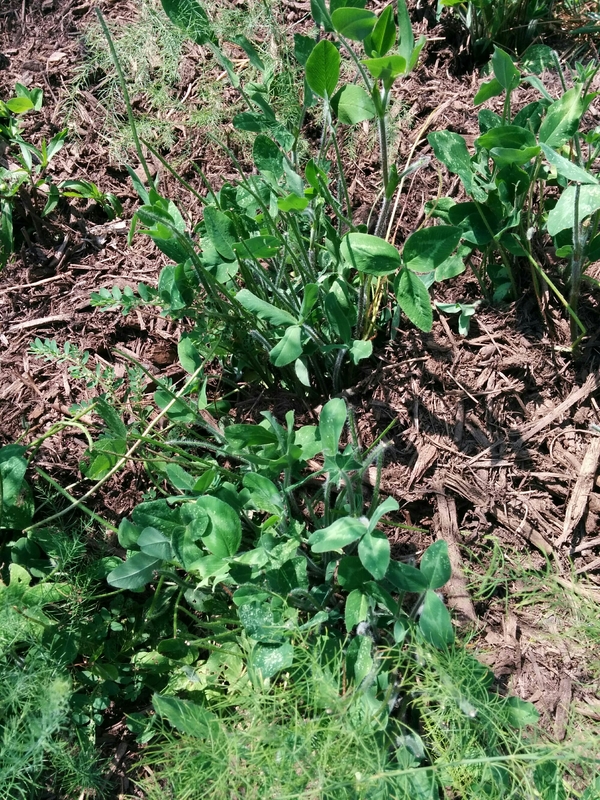 Leaving stems uneaten puts deer and groundhogs at the top of the list. I have scoured for tracks and found none! I must not procrastinate on fencing the garden any longer, which I will do this week and write a handful of posts regarding its design. The pest eating the hops is a bit tricker as they are likely bugs as the hops are elevated up a small string of hemp twine beyond the reach of any animals, even skilled climbers. 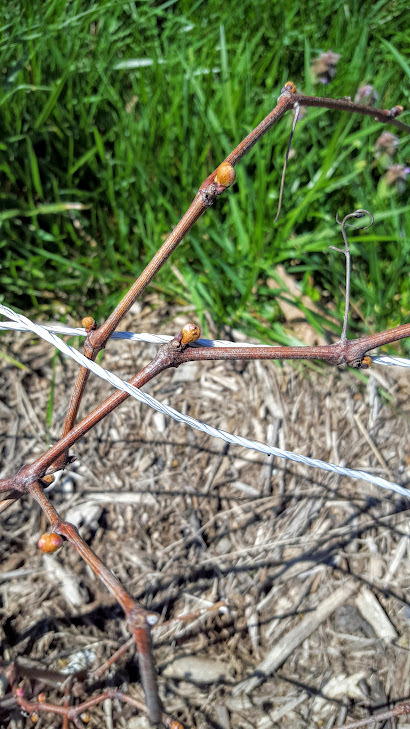 A few vines are completely defoliated at the end of the leaf petiole. If my ruined grape plants are any indicator, japanese beetles tend to skeletonize leaves rather than consume them entirely. Most of the documented pests like slugs or beetles still leave holes in leaves, not entirely defoliate the plants. Maybe some sort of caterpillar? I counted over 20 different species of butterflies in the garden this morning. So with the hops, I am not entirely sure. However I have networked with monthly informal meetings of local growers and will ask around! Beer has been around since some guy in ancient Mesopotamia left grains or bread sitting in water around 10000 BCE. The first appearance in recorded history are in reliefs on Egyptian tombs or in the Epic of Gilgamesh and the first chemical evidence of barley beer is from before 3,000 BCE from jars in Iran. Bitter local herbs have always been used to counteract the sweetness the grain fermentation yields, but in modern times the added anti-microbial properties of hops have made them them almost the sole bittering agent used around the world. The craft beer boom of the last few decades have capitalized on the aromatic and flavor characteristics of some varieties as well. 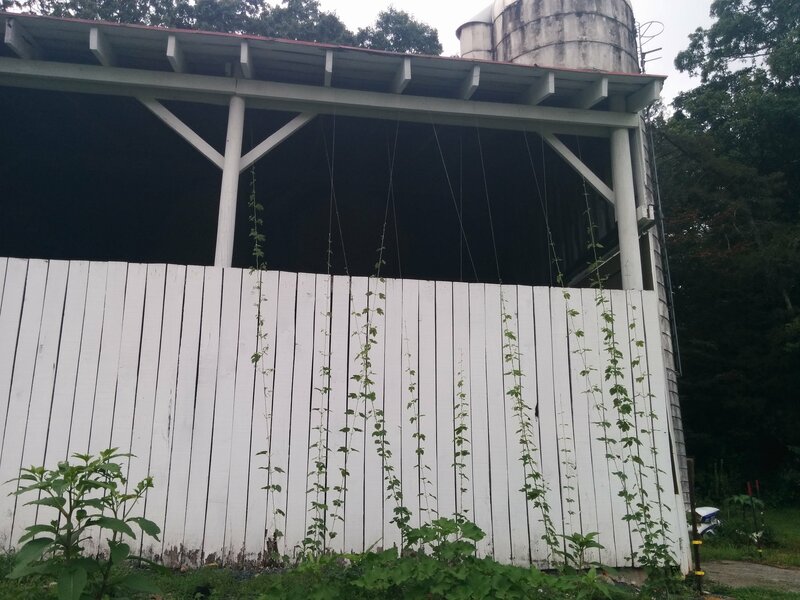 Hops are vertical vine climbers and will be grown up the front of the barn. While enjoying full sun, they can get scorched with too much afternoon exposure so hopefully they will enjoy the trellises hung from the barn rafters 25 feet overhead while getting some afternoon shade from the structure. If they shade the open section of the barn, awesome! More than anything I just want them to grow UP and not outward on ground level. They will be contained by root barriers like these: 24″ x 100 ft. or 18″ x 100 ft. Rhizome plantings are used to produce female-only plants as males plants pollinate the flowers causing them to seed which destroys their use in beer. Same varieties are recommended to be planted no closer than 3 ft’ apart while separate varieties should be no closer than 5 feet apart (source). Soil ever allowed to dry completely will likely kill the plants growth for the year so heavy mulching and regular watering will be applied. I’d like to branch out and see which varieties grow well here in the Shenandoah Valley of Virginia using organic methods but here is my starting point. 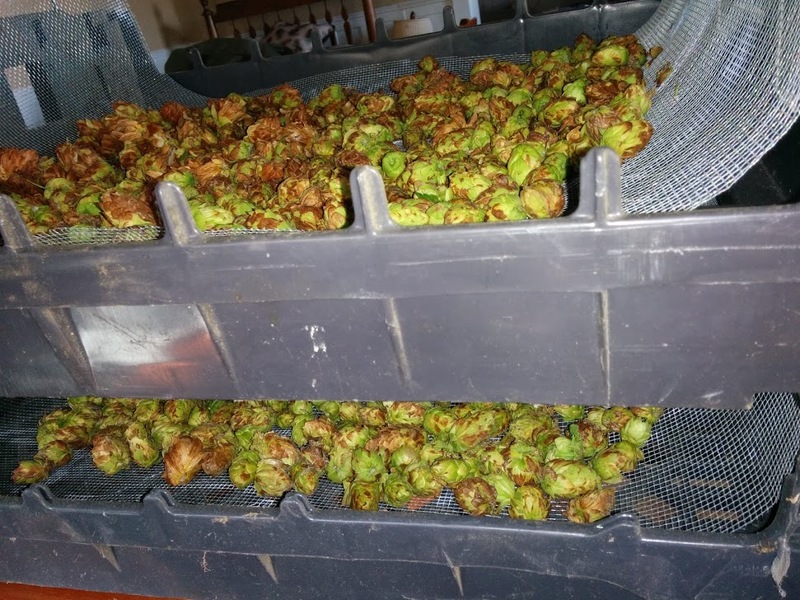 Sticking with my garden theme of focusing on growing plants I will personally use (or help the plants I enjoy), I will grow mostly Cascades and Willamette hops, with smaller plantings of Magnum/Zeus (CTZ) or other High Alpha Acid Percentage (AA%) hop meant for bittering. I’m going to try out a rhizome of Sunbeam Golden hops as the leaves are beautifully yellow and they prefer partial shade. I’d love to grow Simone or Amarillo hops but their genetic information is patented and I could not sell them let alone obtain rhizomes. 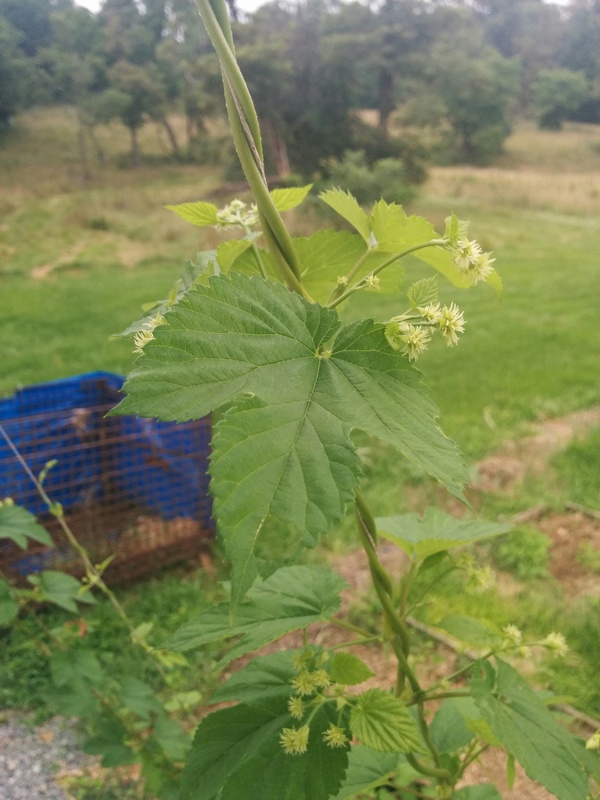 There are literally zero recommended companion plants as they would most likely get smothered by the spreading hops roots. I plant to toss in some marigolds, a sunflower or two and some potted basil to determine the best companions myself. 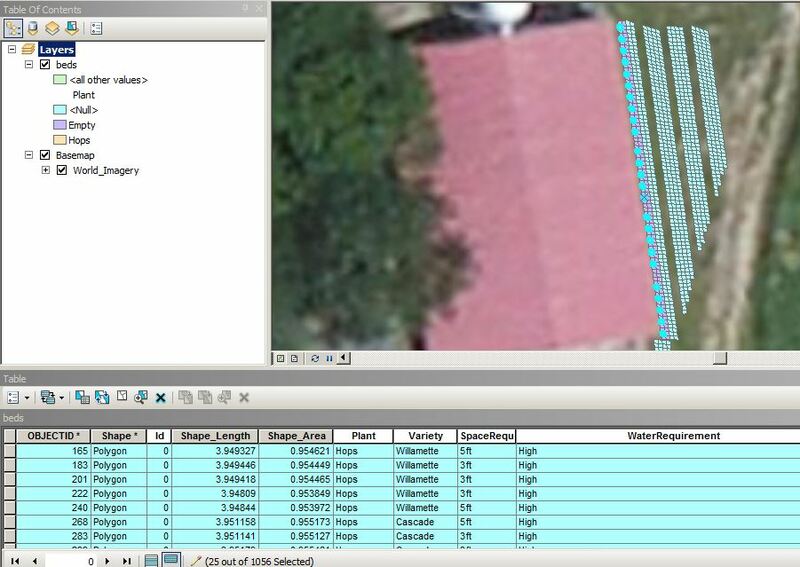 Using the growth requirements mentioned above, the mapping part is as simple as adding the data to each grid. 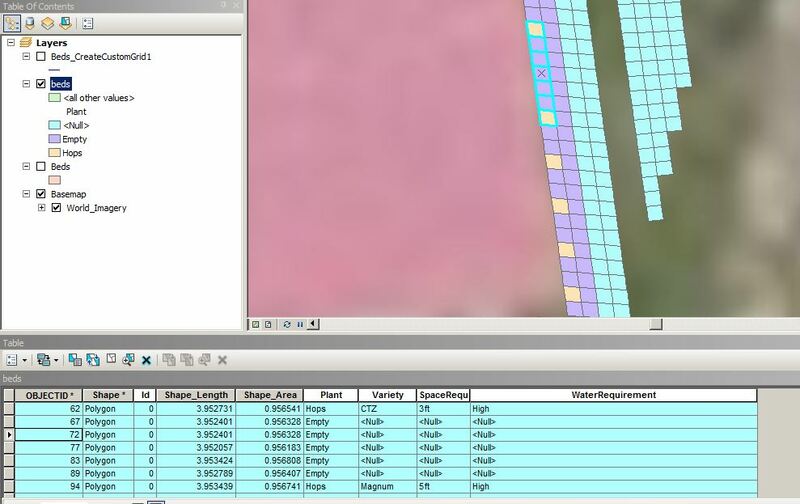 Here is a peak into the GIS database which represents where to plant the individual rhizomes. I came across an interesting article from the Yale School of Forestry and Environmental Studies. One of the oils in hops plants has pesticide-properties that are fatal to varroa mites but safe for the bees!